This week we will be looking at one of the most famous and well-studied dinosaurs of all time. Let's make way for Iguanodon bernissartensis! Iguanodon was a plant-eating dinosaur that lived in what is now Belgium, during the early Cretaceous period, about 125 million years ago. Adults measured roughly thirty three feet long from beak to tail, and would have been comfortable walking on all fours or as bipeds. 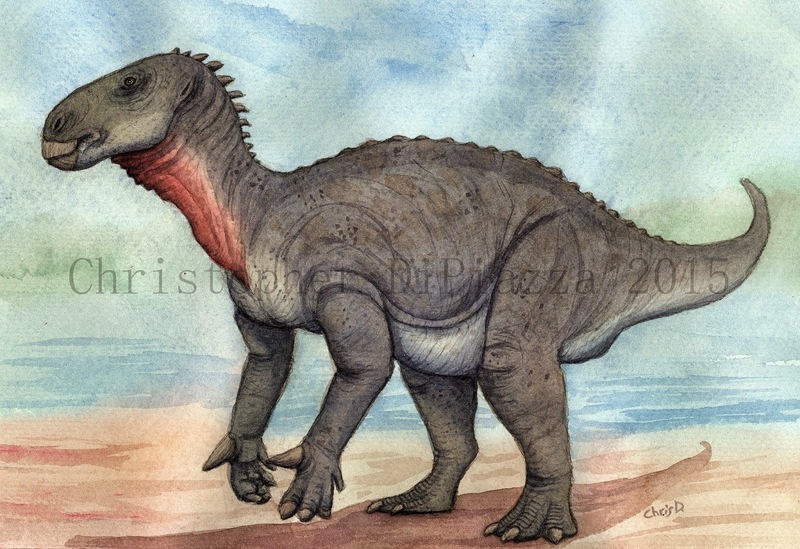 Iguanodon belongs to the ornithopod group of dinosaurs, and was closely related to Tenontosaurus and Mantellisaurus. 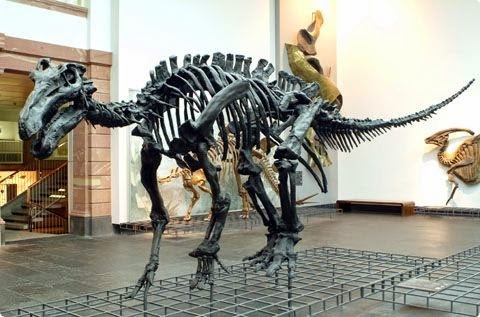 (which even used to be considered a kind of Iguanodon) Iguanodon also has family ties with the later duck-billed hadrosaurs, like Parasaurolophus and Edmontosaurus. 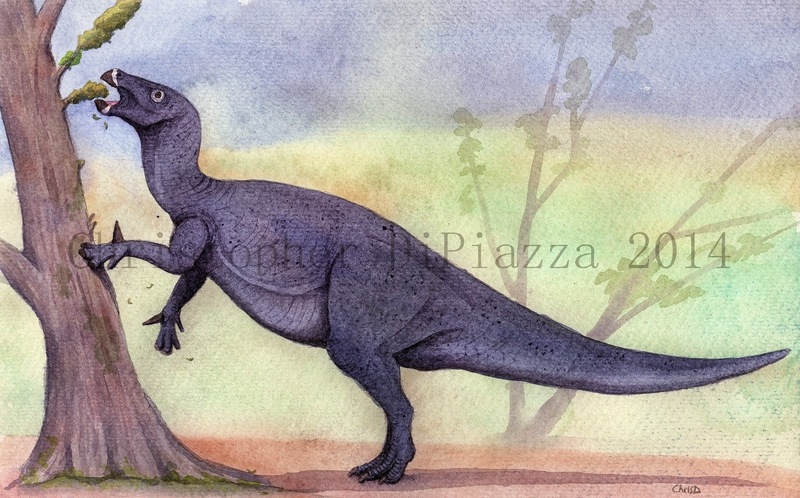 Iguanodon bernissartensis life reconstruction by Christopher DiPiazza. Iguanodon was one of the first ever dinosaurs to be recognized by science. Humans had been discovering dinosaurs for thousands of years prior, of course, but Iguanodon, along with Megalosaurus, was one of the first to actually be called a "dinosaur". This happened back in 1822 when scientist, Gideon Mantell and his wife, Marry Ann, discovered some very strange fossilized teeth, in England. Upon closely examining these teeth, Dr. Mantell realized that they were very similar to the teeth of modern iguanas, which are mostly plant-eaters, and concluded that the fossil teeth he had found must have come from some sort of gigantic, plant-eating reptile. A few years later, several large bones, including limbs, part of a tail, and some vertebrae were discovered which were determined to be from the same kind of animal. The animal was named, Iguanodon, which translates to "Iguana Tooth", because of...the teeth...and the fact that they looked like iguana teeth. The first reconstructions of Iguanodon were based off of very little information, and were largely inspired by modern reptiles, mainly lizards and crocodiles. Life-sized models of this version of Iguanodon, were erected, along with several other prehistoric creatures, in the gardens of the Crystal Palace, in England. The palace, itself, has since burned down, but the statues in the garden are still standing, and can be visited still today. It is a cool reminder of what our perception of dinosaurs used to be when we first started studying them. Iguanodon statues in the gardens of the Crystal Palace in England. Note how lizard-like they are and the fact that they have nose horns instead of thumb spikes. Okay, ready for some confusing information? Good. That whole story about Iguanodon being discovered way back in the 1800s and being made into a beautiful statue...may not have been based on the dinosaur that we call Iguanodon today. If you were paying attention, you may have noticed that that story took place in England, but I said that Iguanodon lived in what is now Belgium! What's the deal? You see, since those discoveries in the 1800s, many dinosaurs similar to those specimens have been found, and they were all named Iguanodon. Pretty soon there were lots different species of large, plant-eating dinosaurs from all over Europe and even parts of the United States with the genus name, Iguanodon. It wasn't until recently that these dinosaurs were re-evaluated and divided into different genus where necessary. By the end of it, only one species remained standing with the official genus name, Iguanodon. It was the most completely known, and it was from Belgium. The original bones from England were likely from a different dinosaur, we know call Mantellisaurus. (Which was very similar to the animal we now call Iguanodon, but not the same.) Thanks, taxonomy! Mantellisaurus life reconstruction by Christopher DiPiazza. Note that the arms are much shorter than the legs. Iguanodon had much longer arms proportionally. Since the 1800s, many more specimens of Iguanodon and its close relatives have been discovered, giving us a more accurate depiction of what it would have looked like when alive. We now know it would have had a beak in the front of its snout and could have easily walked on its hind legs if it wanted to. The front limbs were long, about 75% the length of its hind legs, and each armed with five digits on the hands, the first of which, took the form of a broad spike-like claw. This spike was originally incorrectly believed to be a nose horn, which can be seen on the Crystal Palace statues. Scientists are still not completely sure as to what these claws were for, but they could have been for defense against predators, or possibly for fighting within the species for dominance. The next three digits on the hand were broad and strong, and would have had claws similar to hooves on them. These fingers were good for supporting the weight of the animal's body when walking on all fours, and were not very flexible. The fifth, and last digit on each hand, jutted out to the side more and was flexible, possibly for manipulating food. 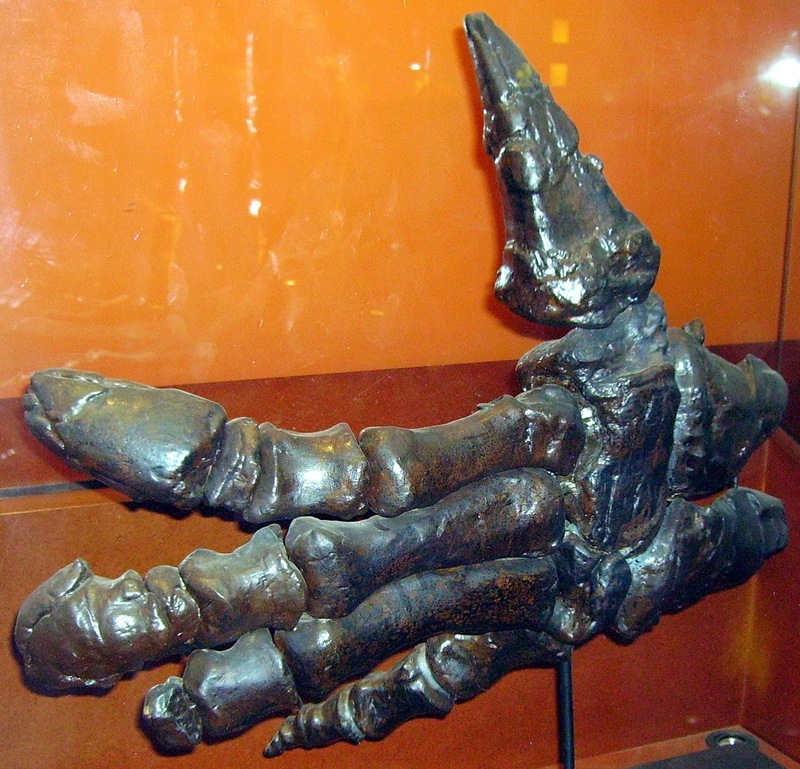 skeletal mount of an Iguanodon hand. There is no real evidence that would suggest Iguanodon would have lived in groups when alive, unlike its later cousins, the hadrosaurs. At one time, fossil sites yielding multiple Iguanodon skeletons caused some people to think they could have been social, but it was later discovered that those skeletons, despite being in the same area, were from animals that each died years apart from one another. They most likely had each washed down a river and ended up at the bottom of the same lake. Carpenter, K.; Ishida, Y. (2010). "Early and "Middle" Cretaceous Iguanodonts in Time and Space" (PDF). Journal of Iberian Geology 36(2): 145–164. Naish, Darren; Martill, David M. (2001). "Ornithopod dinosaurs".Dinosaurs of the Isle of Wight. London: The Palaeontological Association. pp. 60–132. ISBN 0-901702-72-2. Norman, David B. (2004). "Basal Iguanodontia". In Weishampel, D. B.; Dodson, P.; Osmólska, H. The Dinosauria (2nd ed.). Berkeley: University of California Press. pp. 413–437. Paul, Gregory S. (2008). "A revised taxonomy of the iguanodont dinosaur genera and species". Cretaceous Research 29 (2): 192–216. Sues, Hans-Dieter (1997). "European Dinosaur Hunters". In James Orville Farlow and M. K. Brett-Surman (eds.). The Complete Dinosaur. Bloomington: Indiana University Press. p. 14.